Category Archives for "Home & Garden"
Many regular smoke cookers claim that smoked meats tend to dry out too much. If you love the smoky aroma of foods but hate it when your meats and veggies seem to be too dried out and brittle then you can defiantly consider the Southern Country 2 in 1 Electric Water Smoker. This is one of the best multifunctional smokers in existence because you can use it to smoke your meats or add water to your smoker to steam cook and keep your food nice and moist while the hot temperature of smoke does its work in creating delicious smoky sensations in your food. The overall design of this 2-in-1 smoker is pretty simple, yet different from most smokers since it is round in shape and stacked. This smoker is matt black in color and has a stackable design with a top lid. The smoker has a built-in temperature gauge and is vented with a tight-fitting door. Control – The 1500-watt smoker functions via analog temperature control which is easy to use and offers different temperature settings. Water pan – A 5.5-quart water pan enables you to slow cook/steam cooks your foods while smoking the food. This keeps food nice and juicy no matter how long you choose to smoke cook your food. Side fitted loading system – The smoker is pretty simple to keep stocked because it is fitted with side doors that ease the process of adding wood chips or water as you proceed. Portable – The smoker is incredibly light. It weighs only 23 lbs which makes it pretty easy to transport wherever and whenever you need. Capacity – The smoker has dimensions of 27 x 21.5 x 37 inches but offers generous food capacity of 351 square inches of cooking surfaces. This is more than enough to smoke about 50 pounds of meat at the same time. Cleaning – The cooker is pretty easy to keep clean since most trays are removable and the chrome grids are also pretty easy to remove for scrubbing once you are done the cooking. When considering all of the best tasting meats in the world we can all agree that one type stands out from all the rest and that is smoked meats. Smoked foods are without a doubt the most delicious foods in the world. That smoky aroma compliments meats perfectly enhances the flavor of foods and results in a lingering aftertaste that has you hungering for another bite of these flavorsome treats. The only problem with smoked meat is the fact that it is so expensive. You can easily pay double in store for any meat product that is smoked but the good news is that there is finally a product available on the market that allows you to make delicious smoked foods from the comfort of your home. Electric smokers are revolutionary in every way, especially since they are so quick and easy to use. If you are in need of a kitchen and food upgrade in your home that is bound to bring lots of joy to you and your family for many years to come then this is the best appliance you can possibly consider. You can smoke all types of food – In a store, you will only find smoked meats such as sausages but these smokers are suitable for preparing all types of foods. Electric smokers give you full control over the temperature of the smoker which enables you to cook just about any food under the sun. This includes all meat types such as chicken, sausages, beef and much more as well as vegetables such as corn, tomatoes, onions and anything else you think would complement your meats well. They are easy to use – Charcoal and wood smokers are challenging to use. You need to sit by them all day, they take forever and you do need quite a bit of technique to get your food done. Electrical smokers, on the other hand, are easy to use because most of the hard work is taken care of automatically. You can leave it alone – There is no need for you to mind the fire when you have an electrical smoker. The smoker will automatically take care of all of the cooking while you enjoy other activities such as swimming, catching a game on TV and more. Easy to maintain – There is no need for you to stock up on wood or charcoal or to sit by your smoker while it is on. Electrical smokers are also a lot cleaner and unlike with fire, it leaves no mess for you to clean up afterward. The inside of these machines is designed with stainless steel that is also pretty simple to keep clean. Durable device – Electrical smokers are designed to last and will provide you with lots of joy for many years to come. The best-tasting food at home – These devices take your cooking skills to the next level. You can provide family and friends with ultimately delicious meaty and veggie treats that can usually only be found in the most expensive restaurants. You can enjoy the best tasting foods from the comfort of your home without all the hard work. Enjoy affordable smoked foods – This is probably the top reason to invest in an electric smoker. Smoked foods and especially meats are very expensive. You can make your own delicious smoky foods at a fraction of the cost of store bought foods. Eat healthier – When buying in a store, you never know what exact ingredients are included in smoked foods. But when you make your own smoked foods you still get to enjoy fine dining and you get much more control over your ingredients. The fact that you have more control over additives, colorants, spices, fats, salt and other ingredients that are added to foods makes it much easier for you to eat healthier without having to give up that delicious smoky flavor of these types of foods. Smoking meats is also often considered as healthier since you don’t lose any nutrition as with boiling foods. Decided to invest in an electric smoker? Well, now the real fun begins because it is now time for you to shop for the best one for your unique needs. There are quite a few different types and brands of smokers on the market at this time and many of these are superb in functionality and quality. So what type of smoker is best for you? Here are a few guides to help you choose the right one for your home. Consider the size – Electric smokers come in a variety of sizes. Most smokers can be used for food prep for about 8 people at a time but there are also smaller and bigger ones available on the market. Consider the size of your smoker before you buy. If you have a big family or are often inviting lots of friends over then choose a medium to a large smoker. If you only cater for a few then a small smoker should be fine. Consider your space – Do you have a lot of space for a smoker in your barbecue area or are you limited on space? If space is an issue then always choose something with a compact design. Consider the materials – The type of material your smoker is made off affects two things; the durability of the device and your ability to keep it clean. Cookers with a stainless steel interior are the best pick because this metal is durable and easy to clean. Consider performance – Are you new to smoking meats? Then choose something simple for beginners such as an analog temperature control smoker but if you are already experienced and want to achieve perfection then look for something more intermediate such as a digital control smoker so you can have more control over the settings or enjoy more freedom thanks to time settings. Complex smokers enable you to control the temperature more precisely and consist of more than one heating element. Consider the brand – There are quite a few terrific electric smoker brands out there on the market and it is best to go with a trusted brand because that is the only way ensure that you invest in a good quality device. Trusted brands are also much more likely to replace a faulty smoker or to give you a full refund. Consider the price – Naturally, you need something that suits your budget. Smokers range from $100 too much higher depending on the brand, size, and functionality of the cooker. Simple analog smokers are a lot cheaper than digital electric smokers with lots of features and settings. The smoker you need should fulfill in your needs and should also match your budget although it probably is better to overstep your budget just a little bit in order to find something that is big enough or flexible enough. Consider mobility – Is your smoker going to have a dedicated spot at your barbecue area or do you plan on taking it along on trips? A big and bulky smoker is no problem if it isn’t going to be moved around much but if you do want to transport it with ease then it might be best to look for a smoker that is smaller and lighter. 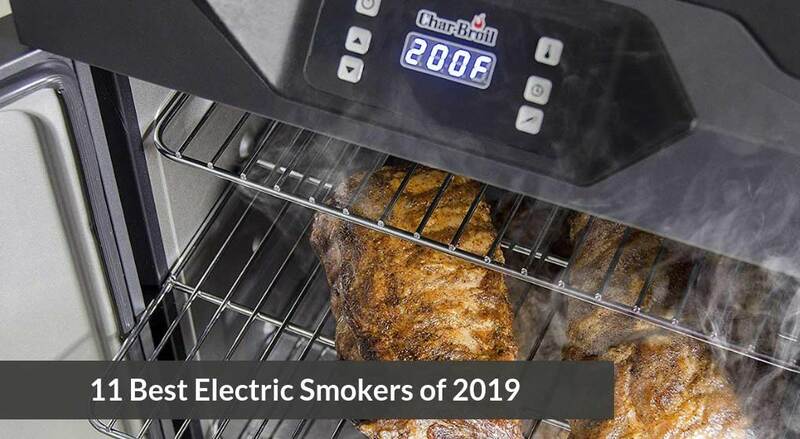 The best way to pick the right electric smoker for your home is by playing it safe and the only way to do this is by investing in the best of the best. Up next we are going to discuss all the best electric smokers currently available on the market. These 11 top picks are all excellent quality and perfect for thrilling all of your friends with foods that are beyond delicious. 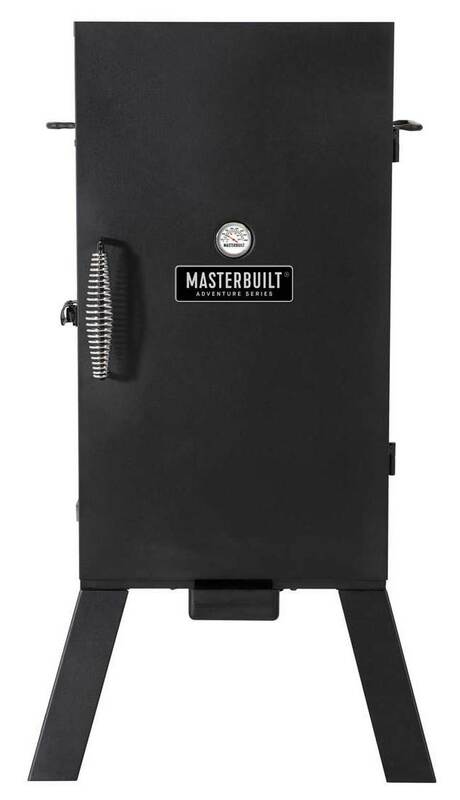 Masterbuilt is known for their reputation of producing high-quality products and their 30” 20071117 Digital Electric Smoker certainly contributes to their strong reputation. This smoker is simple in design, yet stylish and it gives you all the functionality you will ever need. A digital panel gives you full control over the temperature and time. The interior consists of four chrome-coated racks and it even comes with a side wood chip system that enables you to ad chips without having to open the smoker. This smoker is fully insulated and you can use it for smoking all types of foods including meats such as chicken, turkey, ribs, sausages and more. It is also pretty big and can hold up to 6 whole chickens, 64 sausages or 4 pork buts. The smoker is pretty easy to use but you do need to understand how different temperatures will affect different food products. All in all, this is one of the best electric smokers you can possibly own. 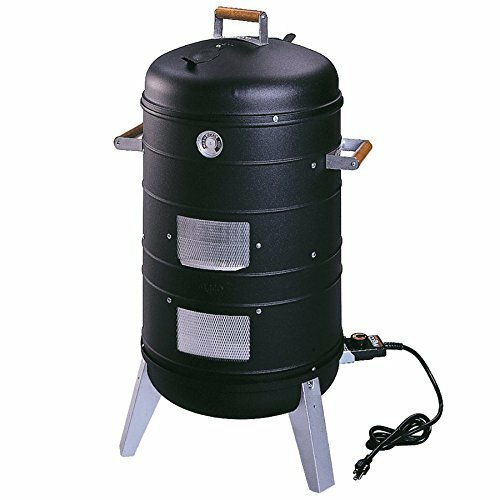 This electric smoker is alleviated above the ground by sturdy steel legs that could make it much more convenient to load and maintain your meats as you smoke them, especially since it is so small. Yes, this is a good pick for small families or couples. The smoker has a capacity of 3.1 cu.ft which is ideal for preparing small quantities of food. The Smoke Hollow 26142E is fashioned with a 1500-watt heating element that gives you full control over temperature. It consists of two chrome-plated cooking grids that you can adjust as you need and has a porcelain coated water pan inside along with a porcelain coated chip tray. The device also has a full range heat indicator and the door is fashioned with a cool-touch spring wire handle which greatly reduces the chance of burning your fingers while minding your smoked foods. This terrific smoker has a max temperature of 325 degrees and a minimum temperature of 175 degrees. This electric smoker is pretty sleek in design and is a perfect investment for your barbecue area. This 800-watt cooker consists of four chrome-plated grates. It is fashioned with a digital thermostat and push-button controls that enable you to set the cooking time, temperature and more. The cooker has a side access wood chip loader and is insulated in order to maintain high temperatures and to cut back on electricity consumption. The smoker also has a removable tray that enables you to easily clean this handy smoker as you use it. This smoker is perfect for someone who needs to prepare lots of meats since it has a 732 square inch cooking area. The cooker is also insulated and fashioned with a high-temperature door seal that keeps heat locked inside. 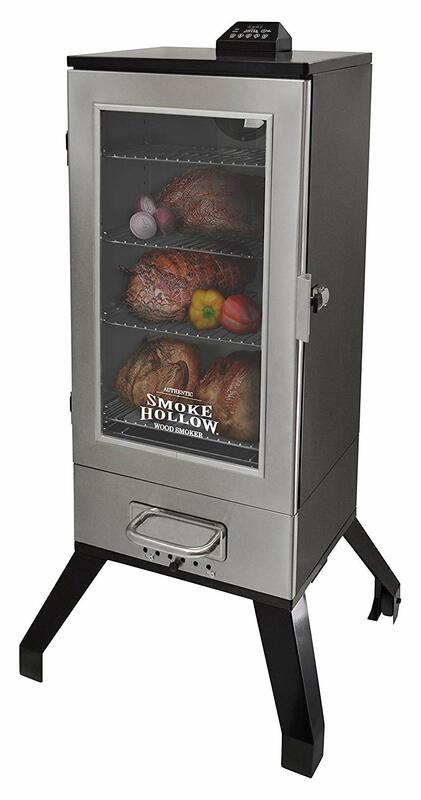 If the previous smoker models just won’t make the cut then you can definitely consider this 36” smoker by Smoke Hollow. This smoker is elegant looking thanks to the beautiful stainless design and especially because of the glass door that enables you to see your foods as they get smoked. This smoker is fashioned with digital display and controls that make it easy to operate and the tempered glass door also eases the smoking process since you can keep an eye on your meats with a simple glance. The smoker has an external-loading wood chip tray that is simple to stock up on wood chips and consists of 4 grids that can be adjusted in height. This is the perfect smoker for large families or for those who are frequently catering for a lot of people. At a whopping 40” or 975sq.inch this smoker is a definite must for anyone looking to do some serious food smoking. This smoker is perfect for those extra-large families but is probably best suited for small restaurants. The 1200watt Masterbuilt 20070311 I sleek in design thanks to its stainless outer and its tempered glass door that allows you to see how your food is doing as it matures inside the device. The smoker comes with a remote control and is fitted with a side loading wood chip tray for easy loading. It also consists of a removable drip pan and it consists of four chrome racks. This smoker is relatively easy to move around since it is fitted with wheels and a rear mounted handle to enhance mobility. This electric smoker is quite advanced and offers a futuristic vibe due to its sleek design and the full digital controls. It is one of the best smokers for medium to large families because it is so easy to use and large in capacity. The smoker is easy to clean, not just because of the epoxy steel interior but also because the ash catcher is simple to remove for hassle-free cleanup sessions. This smoker consists of 6chrome racks and side fitted smoke generator and automatic wood biscuit holder. The cooker is 24 inches wide and can be used for controlled cool smoking for up to 8 hours. It is an ideal investment for outdoor or patio smoke cooking since you have full control over temperature, time, and smoke as you prepare your foods. If you don’t like being restricted to home smoke cooking then this is the right pick for you. This 1400 watt smoker has a functional design that enables you to transport it relatively easily. This smoker is black and simple in design but differentiates from most smokers since it has folding legs that ease transportation and storage. It also only weighs 21.8 pounds which greatly enhances loading and offloading comfort when you are taking this smoker along on a journey. The smoker is analog temperature control with easy dial settings. It is the best possible smoker for road trips and holidays thanks to its mobility benefits such as small capacity, lightweight, and folding legs. You can use this 280 sq. inch smoker to prepare up to 4 chickens or 1 turkey or 2 pork butts in this smoker with its two chrome racks although it should be noted that you do need to open the door to add wood chips. This smoker is another good solution for travelers or for those who might want to enjoy delicious smoked meats on a special occasion in some far of town or city. The smoker is fitted with 2 side handlebars and weighs only 48.5 pounds. While it isn’t nearly as mobile friendly as the Masterbuilt MB20073716, it certainly is a lot easier to transport and move around than other bigger smokers. Masterbuilt is known for their pristine and high-quality equipment and that is exactly why we have included quite a few of their smokers on our little list. The adventure series MES 35B specifically is a 1500 watt machine with a capacity of 548 sq. inch. The interior is chrome plated with 3 cooking racks with a built-in thermostat control temperature gauge in the door. The device also has a removable wood chip tray inside. Unlike most electric smokers, this little beast can also operate on charcoal which could be an added benefit if you are not particularly fond of the smoky aroma of natural wood and prefer the aroma of charcoal smoked foods instead. This smoke cooker is very different from all the rest because it allows you to electrically smoke your meats via wood chips, grill your food over charcoal fire, smoke grill your meats or even smoke cook your foods with a charcoal aroma. The cooker is brilliant red in color, easy to use and is the perfect investment for those who love to try different cooking techniques. It does take a while to fully understand how to operate this smoker, even though it is analog temperature control but learning to work it certainly is worth the extra effort because you can do so much more. You can smoke cook quite a lot in this smoker thanks to its 350 square inch capacity and it even has a 5.5 quart water pan to keep your meats juicy. Are you someone who prefers to switch things up and try new things every time you prepare foods? Then this little smoker might be the best pick for you. It has a double functionality since you can either add wood chips for traditional smoking or water for steam smoking to the smoker. Alternatively, you can even add water to the smoker for a very soft, moist and smoky result. The smoker is relatively large with 351 sq.inch of cooking space and has a chimney-like design with loose fittings. This 1500 watt smoker has an interlocking base and body and consists of two grids that can be set at different levels and enables you to smoke up to 50 pounds of meats. The lightweight and side fitted handlebars of this little smoker also make this an ideal device for transportation. You can easily take this smoker along on any holiday so you can prep delicious smoked foods wherever you please. There is a smoker out there for everyone but we do recommend investing in one of these smokers. They are, after all, the best of the best and we have something for everyone from the biggest smokers to those tiny ones that are so easy to move around, from simple to smart. There is something here for you whether you are looking for the fanciest and easiest to use a smoker or simply need something tough, sturdy and simple for outdoor smoke cooking sessions. The small family – For small families, we recommend the 26” Smoke Hollow 26142E – one of the smaller smokers on our list – or the Masterbuilt MB20073716 Portable Electric Smoker. The average family – For average sized families we recommend the 30” Masterbuilt 20071117 – our top smoker on the list – or the 30” Dyna-Glo DGU732BDE-D or the 30” Masterbuilt Adventure Series MES 35B. The large family – Bigger families should definitely consider the 40” Masterbuilt 20070311 or 39” Brandley Smoker BTDS76P especially since smoking foods do tend to take quite a while. The digital family – Digital freaks will love the 39” Brandley Smoker BTDS76P or our other digital smokers such as the 30” Masterbuilt 20071117. Newbie smoked cookers – If you are new to smoked cooking and don’t understand the temperature settings, time frames and all of that other settings then we recommend an analog temperature control smoker. These are the easiest to use. 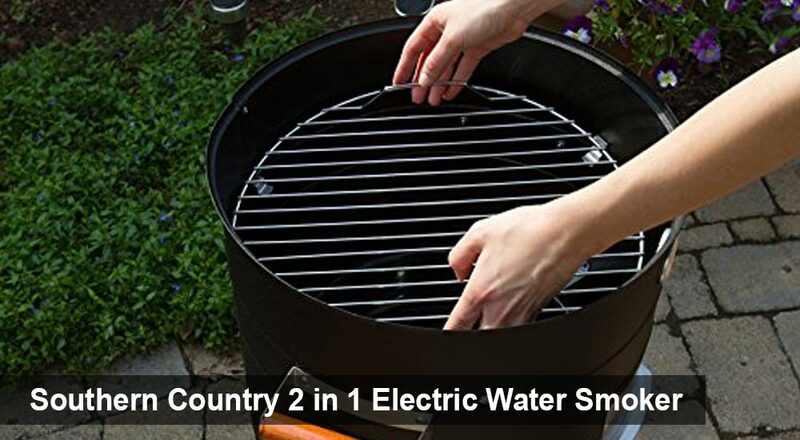 The multipurpose family – Those that want to get the most out of their appliances can definitely consider the Southern Country 2 in 1 Electric Water Smoker that functions with both water and wood chips. The traditional family – If you are someone who loves the traditional way of smoking with charcoal then the 30” Masterbuilt Adventure Series MES 35B Electric Smoker is the right pick for you. This smoker can function with wood chips or charcoal. Any one of these smokers will definitely revolutionize your cooking experiences. They are so easy to use, enable you to create restaurant quality foods from the comfort of your home and gives you the opportunity to save heaps of money on smoked meats. With a smoker in your backyard, you can entertain and thrill guests at home or simply pursue a healthier lifestyle without having to sacrifice any of the taste in foods. If you have always dreamt of owning an elite smoker at home then the 30” Masterbuilt 20071117 is a real dream come true. 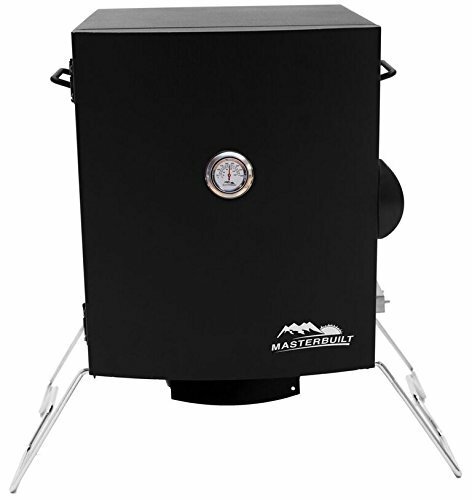 The Masterbuilt brand is one of the highest reputable smoker brands out there because they are known to produce smokers that are durable, functional, practical and stylish. The 20071117 is a perfect pick for those who are new to smoked foods as well as for advanced food smokers that need something functional and reliable. 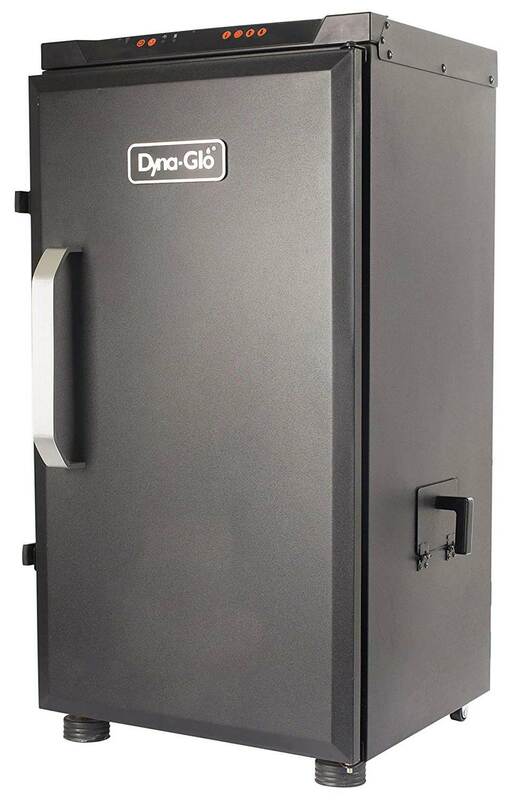 This smoker is remarkably easy to use thanks to its top mounted digital control panel that gives you full control over temperature as well as time settings and thanks to the side wood chip loading system that makes it easy to load more wood chips without disturbing your foods. The last thing you need in that gorgeous barbecue area is a smoker that looks horrible. This smoker certainly won’t affect the appeal of your barbecue areas or outdoor kitchens negatively in any way. It has a pretty sleek design and the matt black paint finish gives you great functionality and durability for outdoor use. The smoker doesn’t consist of too many gadgets and items that might get in the way and makes for easy storage thanks to its smooth and seamless design. ​Generous size – The 30” Masterbuilt is perfect for larger families or even for restaurant use. This smoker detention is 33.27 x 20.47 x 19.88 inches which give you quite a lot of space in terms of food capacity. You can load 6 whole chickens or 2 whole turkeys or 8 racks of ribs or 64 sausages or 24 burgers or up to 4 pork buts in this compact smoker. As you can see, it is quite big enough to feed the entire family or to provide quite a lot of customers at your restaurant with fine tasting smoked foods. Weight – At 39.34 pounds this smoker is rather light for its size which makes it much more convenient to move around or transport should the need arise. Max heat – The smoker can be heated up to 275 degrees Fahrenheit which is all the heat you will possibly need for smoking all types and sized chunks of meat. Sideloading system – You can easily load this system thanks to its side wood chip loading system that enables you to add more chips without opening your smoker. Insulation – The smoker is fully insulated which promotes energy efficiency and reduces smoking time requirement. Digital control – The top positioned digital control is incredibly easy to use and gives the user full control over temperature and time settings. If you are someone who loves to cook to perfection and get the exact expected results every time you turn on your smoker then you will love the 30” Masterbuilt Adventure Series MES 35B. This smoker is sturdy, reliable, easy to use and, once you have mastered its technique, you will always be able to create perfectly smoked foods such as meats, sausages, vegetables and so much more. The 30” Masterbuilt Adventure Series MES 35B is one of the best investments for home use, outdoor smoke cooking and can even be a good investment in small restaurants that don’t mind tending their smoker on a regular basis. The smoker isn’t digital which means you do need to keep an eye on the time and keep loading it with wood chips to keep the smoke rising. But besides that, this is one of the best investments you can possibly own if you love the taste of smoked meats. The design of this Masterbuilt smoker is simple, straightforward and yet elegant and stylish. 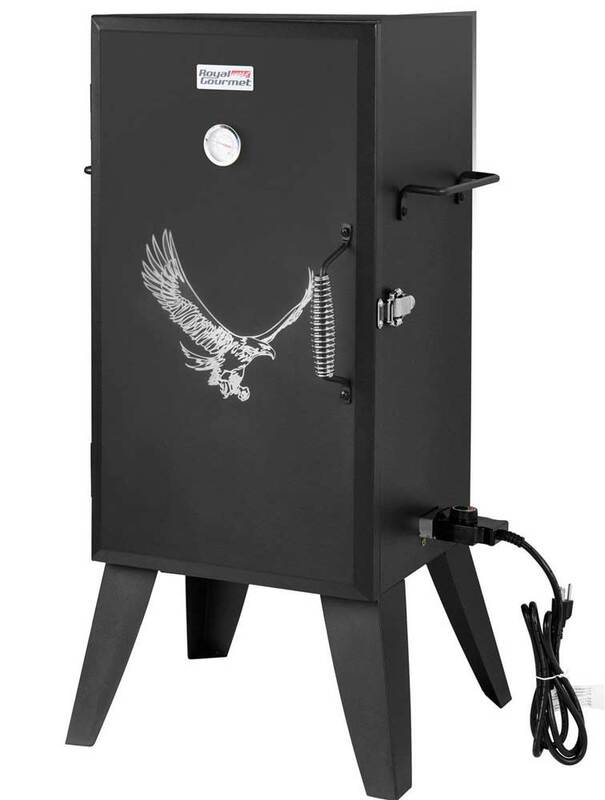 This smoker with its matt black coating, side handlebars, legs, and cool touch door handle will fit right in with the rest of your kitchen, will look brilliant in outdoor kitchens and will certainly be a welcome addition in your barbecue areas. Like all other Masterbuilt products this one is also sturdy in design, durable and functional but here are a few other features you might want to check out if you are considering this smoker for home use. Control – The smoker operates via analog electric control and offers different temperature settings. It also has a thermostat control temperature gauge in the door that tells you exactly what the internal temperature of the smoker is at all times. Insulated – This smoker, like all of Masterbuilt’s other smokers, is also fully insulated to keep the temperature and smoked locked in. 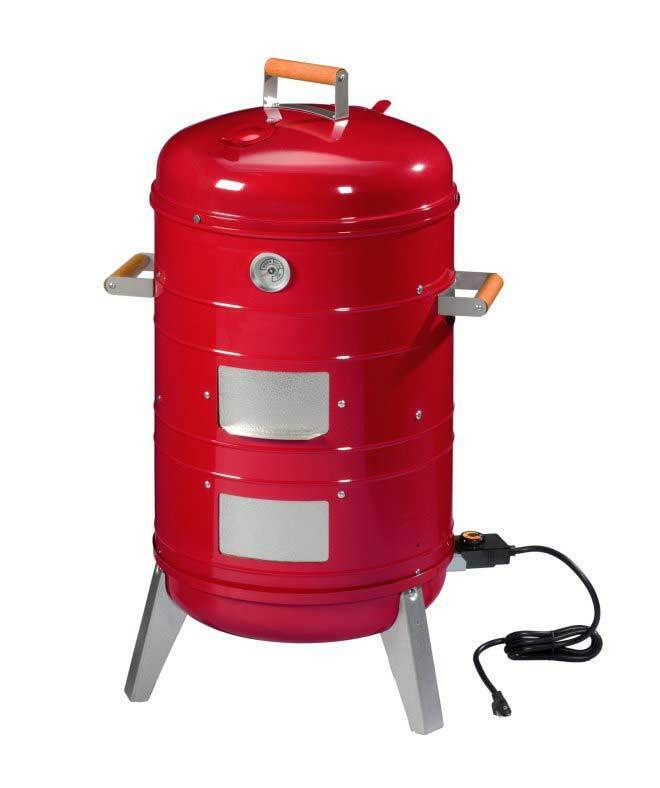 Capacity – The smoker has dimensions of 33.5 x 17.4 x 19.9 inches and weighs 59.3 lb. This gives users a cooking capacity of 548 square inches which is generous enough to feed a pretty big family but more suitable for feeding guests at a party or celebration. Easy to use – Analog temperature control smokers are the easiest to use and the 3 cooking racks of this smoker also allow for easy food stacking and cleaning. No side wood chip loading system. The door needs to be opened to add chips which could result in the loss of temperature and smoke. Quite heavy compared to other smokers. ​Do you want whip your milk into the perfect thick cream? If that’s the case, then try Epica milk frother. Since it was invented it has really outdone the other types of frothers in so many ways. 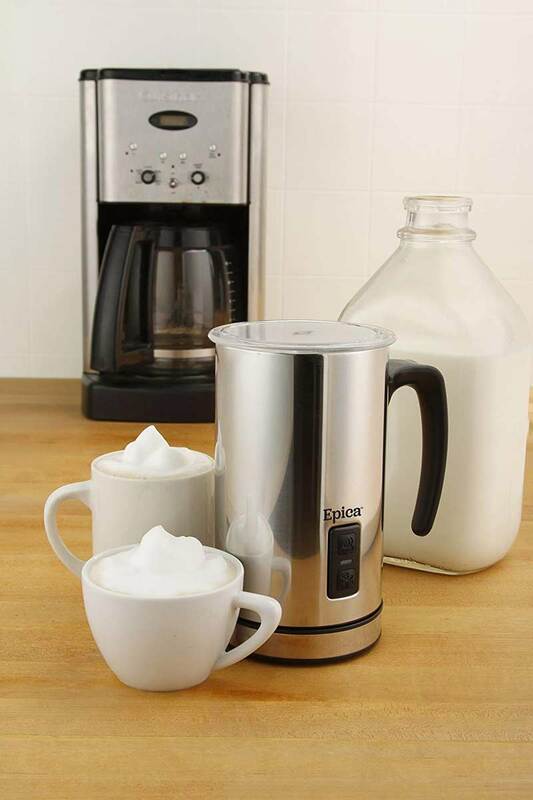 With Epica milk frother; it’s automated, so most of the processes do not require manual input by the user. That makes it so unique from the normal frother. These and other features make the Epica milk frother a must have for anyone who wishes to whip milk. With these features, it’s possible to separate the base and the carafe without altering any connections of the frothier. Many frother are designed in such a way that the cord to the socket and the carafe are permanently fixed, so for instance, if you want to pour your carafe content to some other place like a coffee cup. It means that you have to detach from the socket first. But with the Epica frother you just detach the carafe from the base and pour your content into another cup more easily. The carafe is calibrated into divisions of equal dimensions, this is so beneficial when it comes to serving more than one person. Let’s say your family is made up of five people. The scale has 10 calibrations, rather than random approximations; you can serve each person with 2 units and it’s more of fairness. This helps families with cheeky kids. Most of the shakes are usually made to hold milk for an individual. But what if you have the whole family to serve the foamy milk? or you were on a hike and it happens nobody else carried the shake?. With Epica, you should worry no more about that for it can hold a capacity large enough for more than 10 people hence no scrambling in the event of fewer milk foams. Almost all other shakes are made of plastic. A major problem with them is they are so sticky and pose a difficulty when washing. Epica Milk frother is made of stainless steel, this material has no effects of sticking and the dirt is wiped away easily during washing. For cleaner utensils, Epica grabs a number one spot and for the cases of packing milk maybe for children who are going for school is the most preferable as kids usually will not bother to keep the dish clean while playing. So it becomes easier to wash when they come back home after school. For the case of a normal shake, heat from the environment may warm the milk, or heat is lost from the milk, so it’s associated with inappropriate warming and cooling of the milk. But this is not the case with the Epica milk frother which is insulated by a vacuum preventing all possible convections hence maintaining the milk temperature. Amazon being the most reliable shopping vendor, I would recommend anybody in need of the Epica milk frother to do a purchase from it. With its unlimited features, this price is fair and no other milk frother can be sold such a price. Also, you will enjoy the after sale services offered by Amazon: quick delivery, free return, free delivery and so many others. Also when purchasing the Epica milk frothier especially from Amazon, you are guaranteed a warranty of up to 2 years. Customers who purchased the item from Amazon, most of them rated it a 5-star meaning that they found it helpful when they used it to make form for their milk. 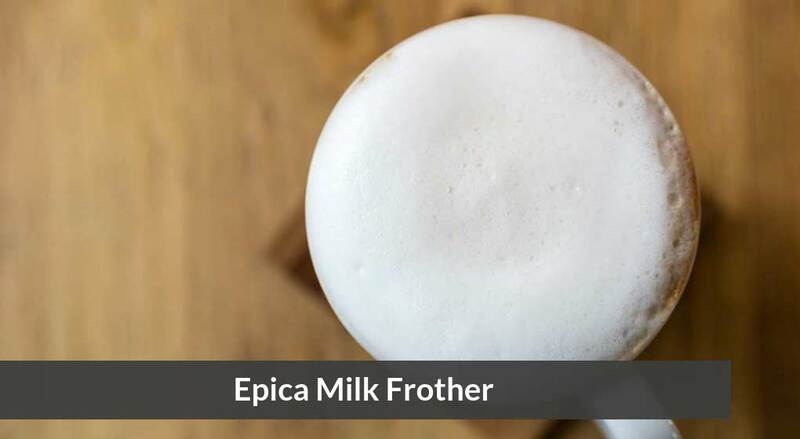 A customer by the name J. Miller on June 15, 2015, reviewed Epica milk frothier as outstanding, he said that the price of the commodity is way cheaper compared to the kind of form it produces. Another reviewer points out about the quietness of the frother, she also explains about its automatic timing mechanism which enables it to switch off once the froth has been formed completely. Though most people review Epica as a God sent frother, some of them really criticises the product and a click gave it just a star rating, one customer explains about the Epica frother working really well for the first days then after a while it suddenly stopped working. He took the procedure to be refunded but all the time Epica always contacted him to make an apology and no money was refunded in his Amazon account. This really got him upset to an extent he rated it one star. Most customers prefer warming milk to a temperature of 100 degrees, in this way the bacteria that may be found in raw milk has been killed. But an Epica frother, the maximum temperature to which the mil can be warmed is 63 degrees, this may result to complications and health issues related to improperly warmed milk. So the best alternative is heating the milk first in an oven of your desired temperature and then transfer it into the frother and that is not the customer’s desire. Epica frother has depicted more positive features than negative ones, and just a mere drawback cannot bar someone from enjoying the unlimited special features of the frother. The best of these features is that it’s automated and can switch off once the heating is complete, eliminating any cases of short-circuiting and even causing the milk to overheat. 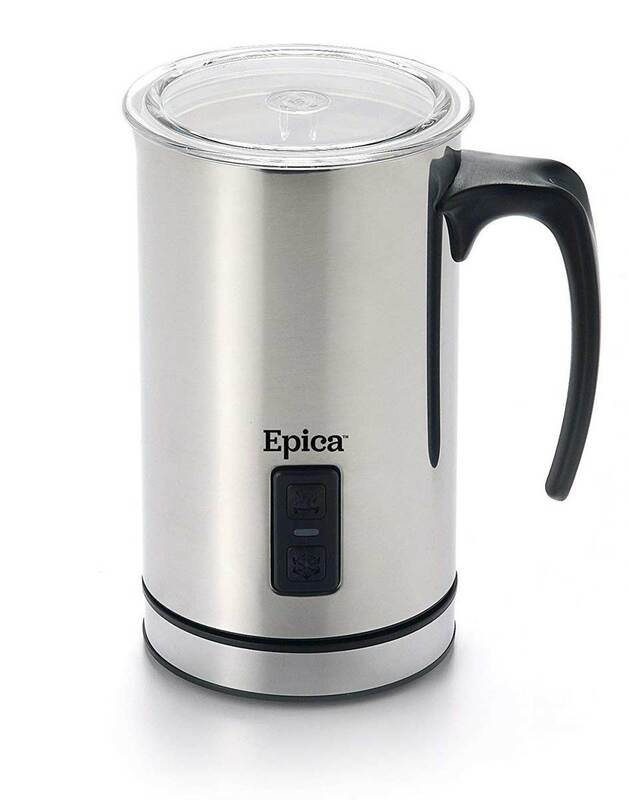 I would recommend anyone who wants to purchase a milk frother to prefer Epica milk frother than any other frother. Are you passionate about coffee? Is instant coffee mixes just not giving you the desired aroma to kickstart your day but you hate all the fuss of a big coffee brewer? Well, the Hamilton Beach 49976 will revolutionize your life completely. This handy dual coffee maker gives you the best of both worlds because it enables you to brew a carafe of up to 12 cups or brew a single cup of coffee with the same device. But that is not all! 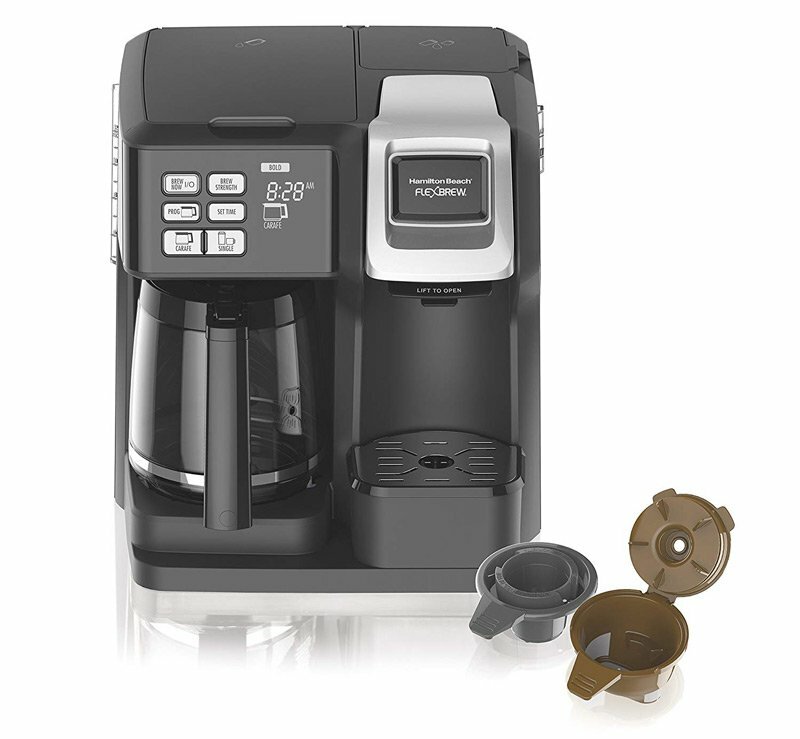 This terrific coffee maker’s single serving side functions with Keurig K-cups or ground coffee. If you want to enjoy infamous Keurig coffee flavors then you simply pop a pod into your machine but if you prefer something a little more affordable then you can always fill up the reusable filter with your favorite brand of ground beans. The brewer has a pretty sleek design. The black and silver colors suit any office or kitchen perfectly and the digital controls provide a modernized feel. This classy brewer certainly will look terrific in any coffee bar. 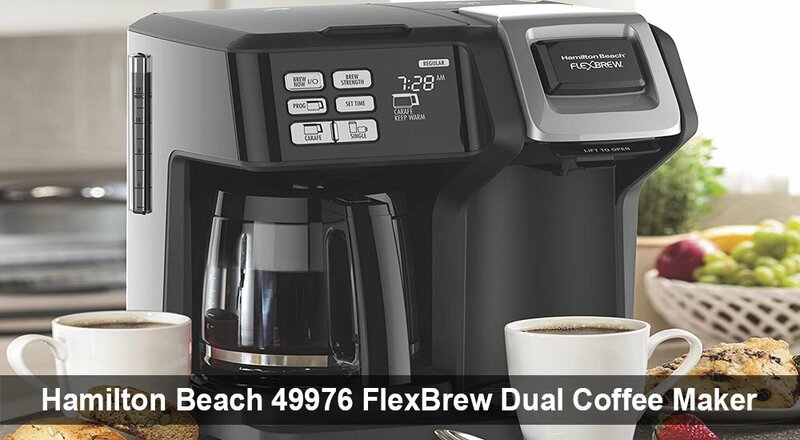 The Hamilton Beach 49976 FlexBrew has a nice and big control display area which allows you to easily program your brewer, select carafe or single cup brews and even set the brew strength. The controls also display the time and allow you to set the device for automatic brewer. For safety, this brewer comes with a 2-hour auto-off function that cancels the hot plate automatically. This brewer offers you quite a lot of flexibility. You can brew an entire carafe of coffee or pour a single cup of coffee. The brewer functions with ground beans as well as a k-cup and with those little cups you can make an infinite amount of coffee types. The brewer doesn’t have a milk frother and as such is not suitable for specialty coffees. You can also put brewing on pause to instantly serve a cup of coffee during the brewing process. The device comes with a pod-piercing assembly tool that allows you to easily remove the pods or clean the device with ease. Before you buy a dual coffee maker you should always consider all the top pros and cons. Here are the Hamilton Beach 49976 FlexBrew’s pros and cons. This is without a doubt one of the best dual coffee makers on the market. It is perfect for large families or for office use. Everyone once in their lifetime always goes to the drawer to get a knife only to find that its rusted of very dull. The good news is that advancements are ever improving and the precision and material of knives are changing for the better. 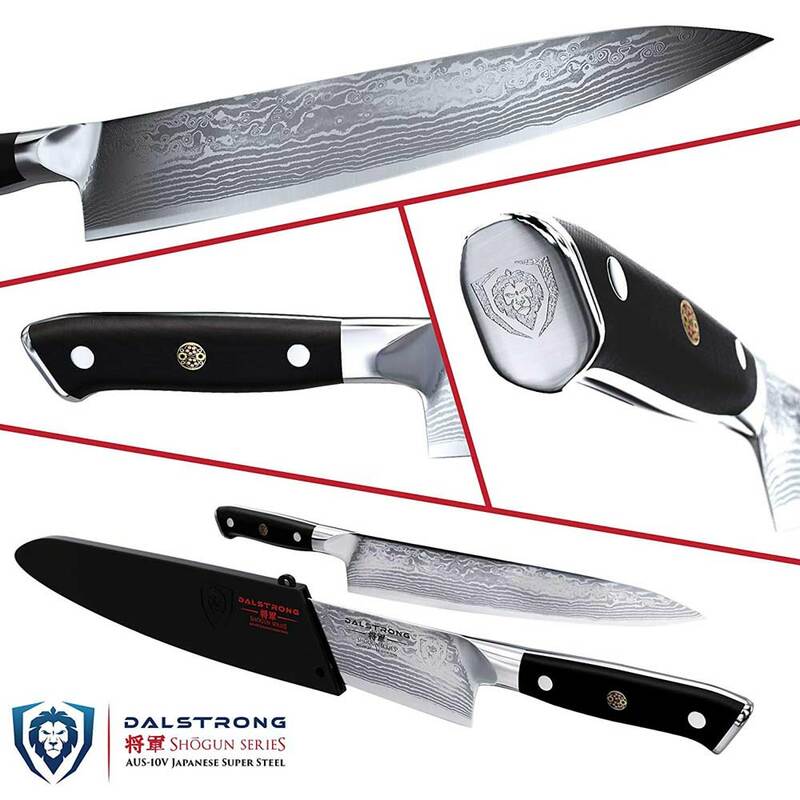 Dalstrong knives are master knives that a lot of the professional chefs in the world use. The blade of the knife is not only sharp but the handle of the knives are built with quality material. This ensures that the knife lasts longer before getting dull. This increases its lifespan and as well the mileage is reduced. 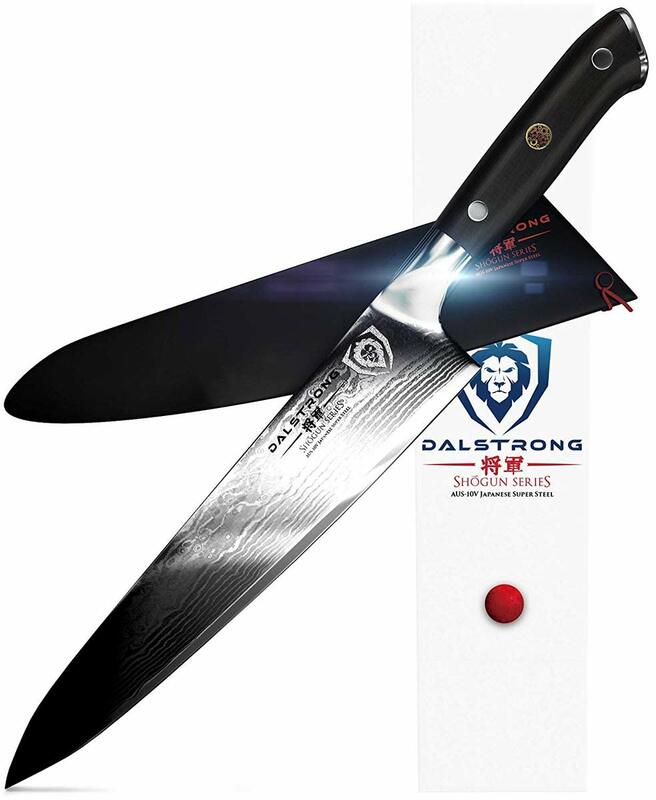 Dalstrong knives opposed to some other top brands sell their products at lower prices and can be found on Amazon. 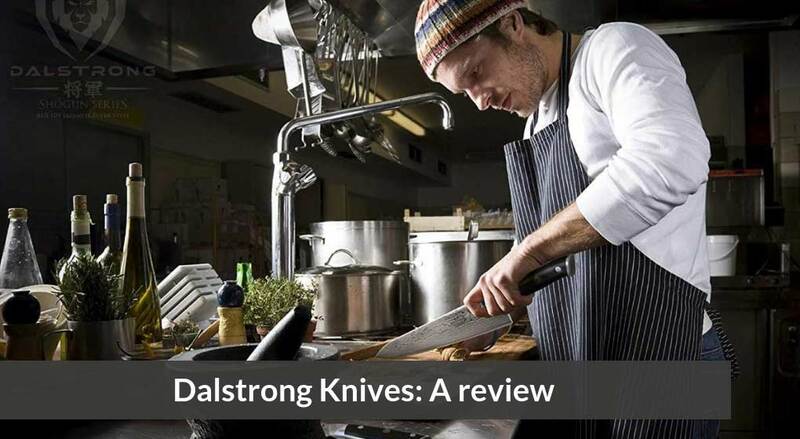 Below, you will find a in-depth review of the Dalstrong knives to see if it fits what you are looking for. Dalstrong knives has a lot of distinctive features. Their features are right from the ergonomics to comfort in handling. This knife can be used from slicing simple fruits and vegetables to carving big turkeys. Dalstrong knives have a unique shape making the one piece design simple and yet solid. You are also able to get different sizes of the knife depending on what your primary purpose of the knife would be. The sheath of the knife offers a comfortable grip which is particularly useful if you are cutting up food for an extended period of time, possible when prepping food. Some of their designs have sharpened edges on both sides making it super efficient and precise. Balanced blade and the material used is long lasting. The knife has a sharp edge. The edge is scalpel in nature and sometimes is referred to as a razor. Some are sharpened both edges to guarantee quick cutting. It’s harnessed with nitrogen making it resistant to rusting. The carbon steel ensures powerful cutting to handle all types of hardness during cutting. This gives it a diversity in terms of applications. Dalstrong knives are made of a strong material. Hardened steel, this ensures that the mileage due to wear caused during cutting is reduced. Also this enables them to cut hard substances without breaking down. Other knife blends possesses a problem of breakdown especially when it cuts substances which are hard. Also it doesn’t go blunt so quick after sharpening. Its block is made of hardwood, which doesn’t dismantle. So a dalstrong knife has a long life span. The common knife has a problem of causing strain to the user. If you use it for a long period, you will develop palm aches. But for the Dalstrong knife, it has the best handle designed with different grips. The handle also tapers to the edge so as to ensure no hand strain while using it. So Chefs who work for long hours prefer comfort in the working and Dalstrong knife gives the best comfort ever. There is a problem a common blade has when cutting up and down. The blade is not stable and vertical blade movements is tiresome. But that is not the case for a Dalstrong one. It’s balanced and the handle designed for the best comfort. Unlike the common one, it is capable of cutting up and down. This gives the chefs the balance they need during cutting. At least all people like to work with things that are appealing. This motivates workers and they do their work to their level best. Dalstrong knife has a shiny colour. This makes it glow and so beautiful. Working with a smart blade guarantees smart work. This feature is so unique and many knifes are dull and not appealing. There are cases where blades are sold and no more company and customer contact after sale. Tis means there is no warranty on the commodity sold. Or maybe there is a warranty but the ways to get refunded are complicated. This is a clear indications that the customer care services are poor. But for Dalstrong, this is not the case. They have a reliable customer care and in case of product failure, few procedures involved to get the knife returned. So their warranty makes sense as you get refunded back. Most customers who had bought the knife rated it 5 stars. They describe the unique features of dalstrong as distinctive. Abby Roggenkamp on September 11, 2017, says that she did a lot of research on the knife. She bought the knife from Amazon and what pleased her a lot was the customer services they offered. The way her issue was handled makes her a good ambassador of the brand. Nicholas J Athanasiou on December 7, 2017 says that the knife comes with a long block for grip. Though others don’t prefer a longer grip as such but for him is the best. He also talks about its attractive features. The customer care he describes as being better than the knife itself. He rates the company five stars and recommends anyone to buy from it. So many customers rate it 5 stars but some also were disappointed a bit. Some complaints about missing knifes a set and others about the block dismantling after a while. On July 16, 2018, Proline Shopper says that he has replaced the sets more than 3 times. The block splits several times and they rust if not polished. This way he rated the knives one star. The overall ratings portrays a positive feedback from the customers. Though some were not impressed by the commodity, they are fewer. A higher percentage rated the knives five stars. This shows that they good for use and customer services are as well outstanding. This is a clear indication the sales of the knives is customer satisfactory. Quality is a preference to quantity. With dalstrong, you are assured of the finest knife quality ever. The material for the blade is harnessed with nitrogen. This prevents the steel from rusting and as well strengthens it. Dalstrong priotise customer care. Any problem after buying the knife is addressed to the company and solved. Most of the customers who purchased the knives have justified that. The price as well is affordable. So for cutlery involving knives. One should consider buying the Dalstrong knife to enjoy its unlimited outstanding features. ​Kitchen mixers authentically transform your cooking style. Thanks to mixers, cake whipping for cool meringues or baking bread is almost effortless and speedy. Using hands to beat sugar and butter is now deleted from the cooking process. If you are a baker, you’ll understand that it is difficult to know if hand whipping was overdone or underdone. In the current market, there is a vast range of mixers with new models making their way every second. Therefore, prior to purchasing one, you have to consider the room available for it and what purpose it will serve. Also, consider how often you’re going to be using it. The costly mixers possess sturdy die-cast frames made of metal to prevent moving on kitchen tops while they’re rapid mixing, which is brilliant. However, if you own no space for such models, then it’s prudent to choose smaller and cheaper models. Standard-wise, nearly every mixer comprises of triple attachments; dough hook for frosting and cake mixing, wire whisk to fold air gently into egg whites and eggs, as well as some sauces and whipping cream. Selecting the best mixer could be a rough time especially with all the model manufacturers claiming that theirs is the best. For that purpose, this honest mixers review has chosen only the top 5 best mixers. Shall we commence? ​So far, this is the best and top rated mixer available in the market. It is very popular with a lot of home cooks possessing it. 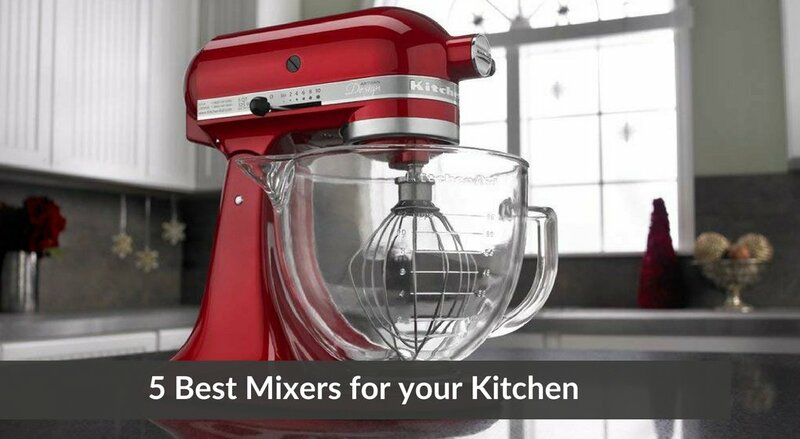 The KitchenAid Ruby red (+ 32 other colors) mixer is very powerful in comparison to other models with a watt power of 325. It possesses a 5 quart larger bowl which permits nine dozen of cookies in a batch. For anyone who wants to have their mixers displayed like earlier stated, it comes in 33 colors. Thus you can select a color that best suits you. Its bowl has a handle, and it’s stainless steel. If you’re cooking or baking for six people, the A 5-qt mixer will do just fine. With it, it is possible to have cookie and cake double batches. KitchenAid is inclusive of triple attachments such as dough hook, wire whisk, and flat beater. Also, there is a pouring shield to keep your kitchen mess-free. This pouring shield possesses a chute for interpolating ingredients efficiently and you’ll find no flour covering your skin. Separately sold the model has different additional attachments like sausage stuffer, pasta maker, and ice-cream maker. It may look like a minute tool, but it is multipurpose in every variety kind. Both the attachments and bowl are dishwasher authentic and safe with the outside being easily cleanable. With 325 watts power for basic recipes, be careful with colossal dough batches or when making a thick dough. You’ll possess precision control due to the ten speeds when you’re whipping eggs or kneading a dough. For anybody who spends hours in their kitchen, this is a perfect choice. It might not have advanced functionality of other models however several cooks find it enjoyable and straightforward. This is the reason it is most popular. With a sixty seven point planetary action of mixing which means sixty seven touch points for every rotation grants perfect mixing and entire bowl coverage. Although KitchenAid Artisan 5 Qt Stand Mixer is excellent with bread dough, you can’t make heavier dough with it. Thus you can opt for a more significant and powerful KitchenAid model. All the same, this setback doesn’t rob it of its first position. For its price, the model and color will determine the rate, but this one is affordable. Shipping also increases the cost but not to worry it’s worth the price. With a weight of 25 lbs, the value of the mixer is just exceptional. Professionals and amateurs who want the best performance, large capacity and the most power. ​The mixer is durable due to the metal construction. ​The ergonomic handle makes the mixer very comfortable. ​With over 25 pounds its weight is substantial. Hamilton Beach is injected with classiness and adaptability which makes it a dual purpose. The lightweight machine functions using mid- style rotation for mixing dough, frostings, and batter which implies that its beaters turn as its bowl spins in an anti-clockwise rotation. This means that should your ingredients be pushed to sides they aren’t going to be incorporated but to incorporate them use side scraping spatula. If you are using for egg whites, the Hamilton produces fluffy and big egg whites. The 4-quart bowl made of stainless steel is sufficiently significant to handle several dough batches. If you’re mixing lighter icings, dough, and batters, this Hamilton mixer is ideal. To the machine, there’s one whisk attachment which aerates correctly thus creating large appealing, beautiful meringues as well as whipped frostings that are fluffy. The Hamilton Beach Classic Chrome Hand/Stand Mixer is also inclusive of various attachments like dough hooks, and traditional beaters. The six-speed quick-burst button permits beating and mixing tailor to get required results. With a peak power of 290 watts, you can perfectly blend and dough in it. Thanks to the Hamilton Beach 6-Speed Classic Stand Mixer, one can push culinary boundaries effortlessly. Hamilton Beach provides a one year guarantee and a warranty to cover for defects so if your model has any defect they’ll give you another one for free. Hamilton Beach Classic Chrome Hand/Stand Mixer gives you the opportunity to decide which tool is ideal for which job. It doesn’t matter if you’re kneading sticky dough batches this mixer will do it entirely. If it's quick- dressing, blend all you need to do is remove its hand from its base to obtain rapid required results. That versatility sort is what this mixer offers your kitchen. What other mixers won’t do is shred chicken except for this stand mixer. Generally, a Sunbeam FPSBH030 mixer comes with beaters, a detachable mixer, dough hooks, three qt bowl made of stainless steel as well as a stand with turntables. You can find the dough hooks on the package’s thin side. Coming with a 250-watt motor, its power is sufficient for a lot of mixture consistency although it’s not sufficient for heavy duty tasks and heavier batters. 400 watts is required if you want it for bread dough purpose. Nonetheless, if you want it for mixing tough dough, you might want it to rest first as you let its motor to cool down. Being a mixer that’s combined, you can detach its central unit or even mount it on its stand too. Detaching and attaching this mixer is a duo hand task. To connect you’ll need to tilt its cradle back then have the mixer inserted on those two slots while pushing it back till it snaps. On the other hand, to detach it, you need to get the cradle tilted back while holding the mixer with a hand then push the mixer’s release button that’s located at the stand’s neck. It is possible to tilt the mixer backward and up when it’s on the stand. That’s vital when you’re adding ingredients, ejecting hooks and beaters and mixing manually. That requires both of your hands to have its button pushed sideways then tilting the mixer. When you release a headlock button, this machine locks into a beautiful tilt position. If you want the mixer to be lowered, again push that button then reduce it then let the button be released. With a click sound, you’ll know that it’s securely locked. Its headrest feature allows this hand mixer to be put down between uses in that the beaters don’t touch a countertop. That’s crucial when you’re interpolating ingredients or doing some hand mixing. The bowl rest tab allows for the mixer to rest on the edge of the bowl for stability as wells ease. With the handle being ergonomically designed hand fatigue is eased. Unlike other mixers that possess corners, this mixer is curved entirely to reduce fatigue. Unlike other average mixers, this one is larger, but you can still manage its weight when you’re using it as a hand mixer. This is possible with regards to the user’s sturdiness and strength per se. Its plastic stand expectedly is lightweight. Since it’s one of the stand mixers that do not take a lot of your cabinet’s or counter’s space, you can store it easily and also take it out and in of the cabinets. That feature is convenient for bakers that do not frequently bake or those that possess sizeable spaces because they can after use they can store it in order to have the counter space free. The mixer seems not to need additional accessories that require to be purchased with it. It’s hard to eject the beaters thus needs all thumbs to have it done. One glance at it and you might think this mixer looks like a child-play toy due to its mere look or that it’s not even powerful at all. That does not matter, and you’ll need to remember that the Cuisinart HM 90 BCs mixer with its elegance and size it’s one of the favorite mixers. If there is a mixer that you can operate with extreme ease, it is this mixer yet it functions just like other mixers in that you can mix very batter type and kind. Boundaries are not in its dictionary due to power it possesses yet so yet it’s very simple to work amazingly. Something unique about it is that it comes with a storage case. It hits other people too because who would want another mixer yet the Cuisinart mixer is handy and efficient? 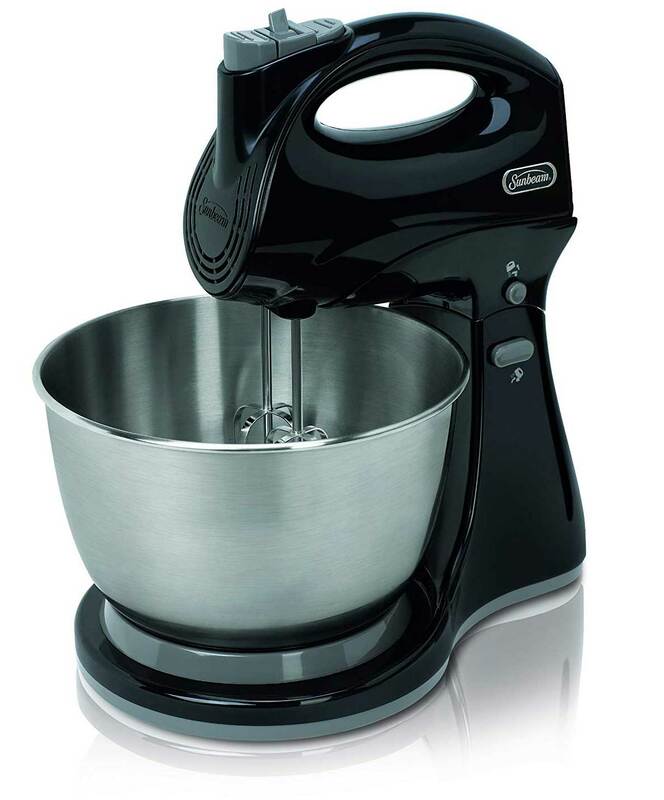 This mixer is user-friendly and classy that you can even gift it to your loved one. Many baking households own this mixer. The Cuisinart package comes with a recipe book, spatula, dough hooks, chef’s whisk and beaters. With a 220 watt power, you can put rely on it to give you pleasing results. It is dishwasher safe so cleaning it won’t take much of your time and also is BPA free. It has nine-speed options of which one is touch speed control. Its button is a simple off and on one. The manufacturers gave it a three-year warranty therefore if yours has some defect, they’ll replace it for you. With a LED display you can pretty much tell if your dough or batter is well kneaded. Also, it possesses a smooth start characteristic plus a clear snap-on storage case. Usually, the mixer comes in two colors brushed chrome and white. This mixer perfectly works with batters, and if performance is included here, you’ll deem it as any stand mixer. Featuring a start-slow function feature splattering can be prevented despite the fact it starts speedily. Additionally, with its beater eject lever, instant touch speed controls, and nine-speed options, this mixer is simple to use and straightforward while giving you the results that you needed. With its affordable price, you won’t believe that the cost is low for its functionality. 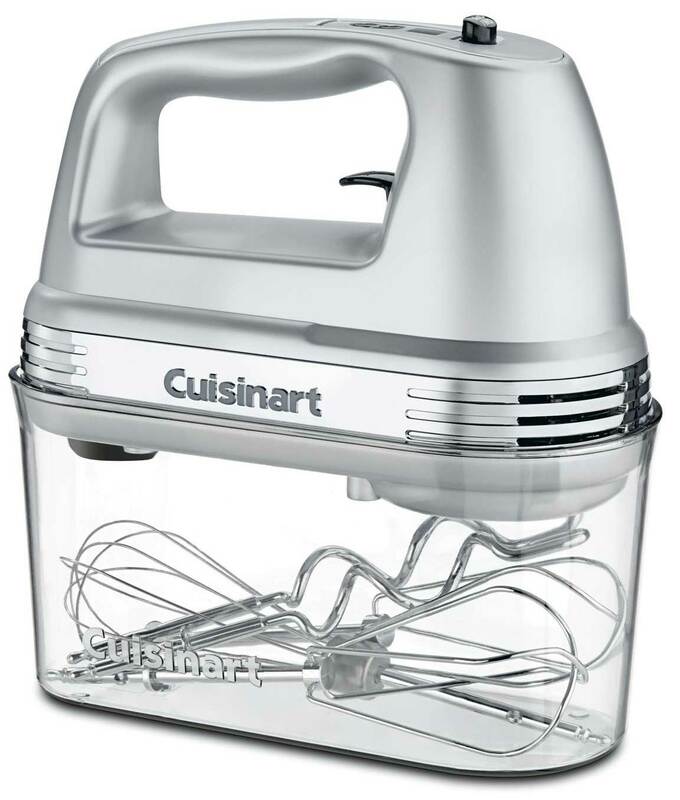 Featuring a compact and slim design Cuisinart 9 speed HM 90 S possesses attractive and sleek design. The storage case is spacious enough to have all the mixer’s part fit in it perfectly. Therefore portability and storage are unquestionable. Never worry about space in your kitchen you will hardly notice its presence. 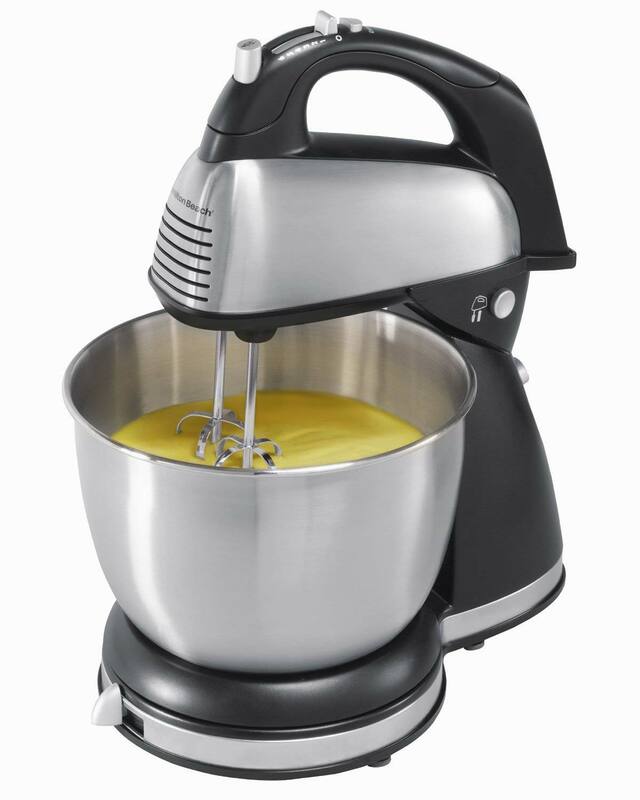 If you love to bake now and then the mixer is a must get for you. Also due to the storage case, you’ll find all the parts effortlessly. Every little component ejects and snaps carefully and quickly. Nevertheless, its cord is nondetachable, and its parts also make cleaning effortless because the whole mixer itself is dishwasher safe. 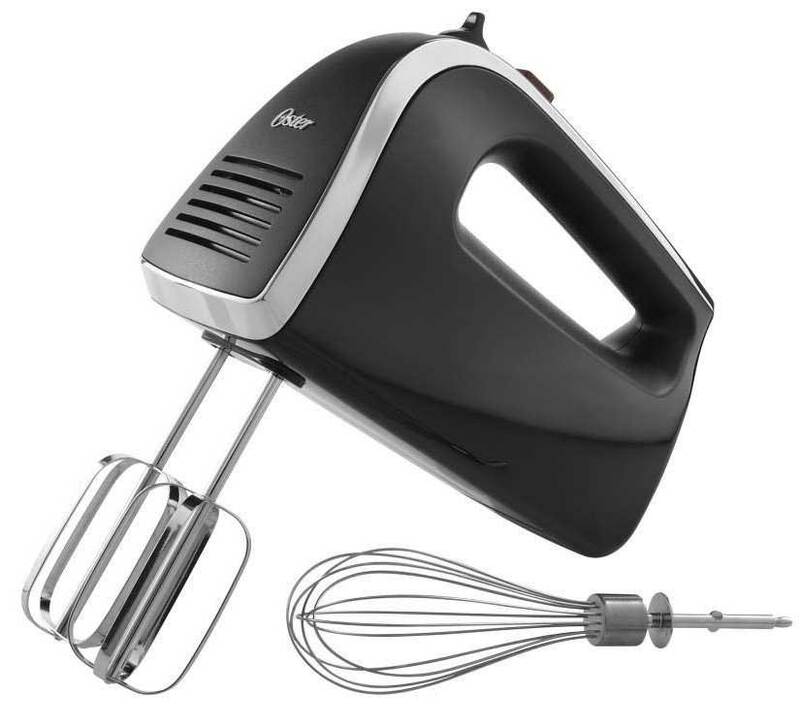 Oster FPSTHM2578 6-Speed Retractable Cord Hand Mixer with Clean Start as the final mixer on this list is deserving of its position on the top 5 best mixers for your kitchen. What makes this mixer authentic and stylish is the fact that it is versatile, lightweight, multi-speed, high quality, durable and efficient. The mixer is an ideal shredding, kneading, whisking, blending, mixing task choice. It does not matter if you’re trying to combine dry or wet ingredients the Oster mixer will do its job correctly. This appliance is compulsory to have honestly. With an inbuilt 250 watt power that’s sturdy helps in the providence of fast, exceptional performance that is needed. Its feature of clean start prevents splattering via commencing the mixer at a low rate speed. Furthermore, the clean start feature provides total control over all the components. Chrome beaters and balloon whisk are provided with the hand mixer which is essential in ingredient whipping, beating and mixing effortlessly. These beaters are essential for combining liquid and dry ingredients such as cream butter, egg whites, and sugar. The balloon whisk is for making whipped cream, fluffy egg whites and hollandaise cream. Moreover, the users obtain versatile outcomes via using beaters and whisk attachment. The Oster FPSTHM2578 being durable performs with broad mixing and beating task range. Users select from one to six-speed options that are situated on top of the handle of the mixer. What you have to do is press the lever to adjust to suitable speed in regards to your requirements. A power bust button also exists to give maximum power and ultimate functionality to this machinery. The uniquely designed retractable cord also adds a sleek look to the mixer. Pull out the power cord when using the mixer then push the button simply when you’re done with the task. Furthermore the retractable cord also provides a neat and tidy compact storage. Its handle is comfortable to hold, and no wrist strain feeling will occur when you’re holding it. However, Oster FPSTHM2578 6-Speed Hand Mixer with Clean Start comes in two color options that are white and black thus when it comes to color selection the mixer is rigid. When you are using the Oster FPSTHM2578 6-Speed Hand Mixer with Clean Start, no noise is produced at all. Overall, the mixer is a perfect choice when it comes to regular usage. ​Price Range: should be affordable. ​Speed Settings: the mixer needs to be speedy enough. ​Look: the look needs to be one that you can conform to and appeals to you. Noise Level: the noise level needs to be minimal and if possible shouldn’t produce any at all. Controls: the mixer needs to have control buttons to serve its purpose ideally. Power rating: a blender should have a watt motor that exceeds your expectation by far. Attachments: Usually mixers have three accessories, but you might want to go for one that has additional attachments. Having the best mixer revives your kitchen life and makes your baking tasks way much more manageable. It will also help you create a meal with ultimate professionalism and mouthwatering taste. Mixers make all mixing purposes fun and quick as you get beautiful results that you’ve been waiting for. Your mixing works fast and more fun as you prepare to bake. They also save time that you could have used to knead manually and give you options to choose from. Honestly doing this review was not as simple as you’re reading it. It took a lot of researches to compile the work to help you choose the best of the top five mixers, and it wasn’t sponsored by any mixer manufacturer. That said it would be interesting to know which mixer you loved and if you enjoyed the review kindly recommend it to your peers. ​If woodwork or just handy work is a hobby then you know the importance of having your own workspace for your hobby. Without a workbench, it can be nearly impossible to get the work done. A workbench makes your work much easier, allowing you to saw, measure, cut in one place. Having a portable workbench makes it even easier as you can move it around with ease, take it to job sites, and what not. 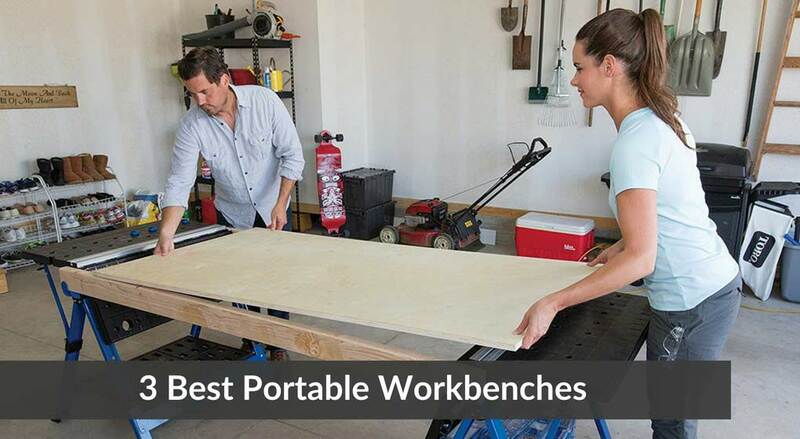 We have picked out the 3 best portable workbenches that will make your life much easier. ​The X-Tra Hand 2-in-1 Portable Workbench is designed keeping versatile in mind, making it one of the most useful workbench. It is a 2-in-1 bench with one side as a workbench and the other can be used as a scaffold. As a scaffold, it has the capacity to hold up to 500 lbs, when the legs are not extended. The table comes equipped with a plastic tool tray that lets you all your tools along with any other loose gear. The tray is designed so you have easy access to everything you need as you work, just an arm length away. There is also a drill-through section that allows you to drill without any problems. Overall, the X-Tra Hand 2-in-1 Portable Workbench is a versatile, reliable bench that allows you to get your work done with ease with a 51”x23” surface and foldable legs. Kreg is known to manufacture tools and accessories of high-quality. 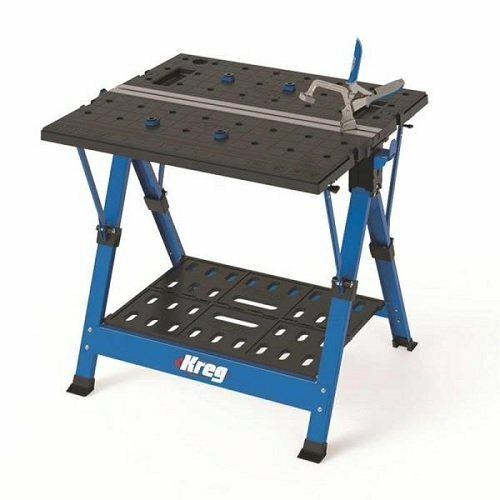 The Kreg KWS1000 is as the name states, a mobile workbench that lets you perform virtually anything you would want. The foldable bench comes with a handle so it is easy to carry around, it is also compact so you can store it away with ease when not in use. The surface of the bench is made of high-quality, durable plastic and has holes on it so it can be used for clamping and anything else you would want. It has two benches in one that you can utilize at once, side by side for more surface or one on top of the other. Overall, the Kreg KWS1000 Mobile Project Center is as portable a workbench you will find and it is made with durable material. WORX is another brand that has made its name with handymen. 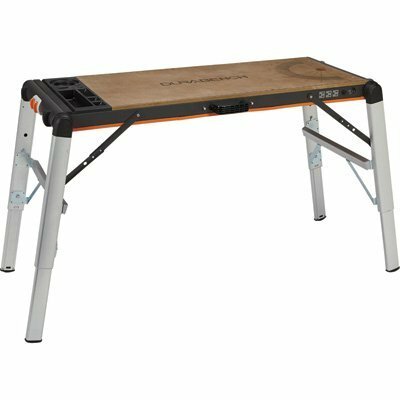 It is known to make quality tools and the WORX Pegasus Multi-Function Work Table is no different. The Pegasus is lightweight but uses sturdy material. This is another versatile workbench, besides the fact that it is portable, you can fold the two sides of the bench and make it into a sawhorse. As a sawhorse, it can support up to 1,000 lbs and as a bench up to 300 lbs. The table comes with a join lock, so you even have the possibility to join two Pegasus tables together for more space. 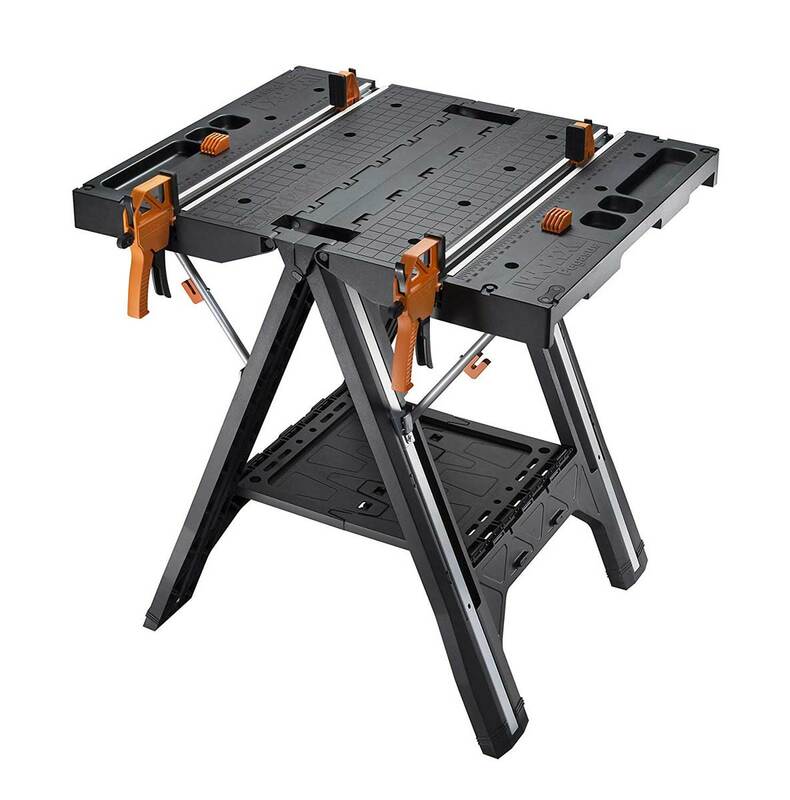 Overall, the Pegasus is a reliable and top quality workbench that you should consider. Unless you are an expert at meditating, you will find it hard to meditate unless you are comfortable. For that reason, meditation chairs are becoming more popular with beginner meditators and even many experts use it for a bit of comfort but not only that, it also helps you maintain your posture as you sit there for longer period of time. Meditation chairs provide leverage and support for your back, especially the lower back so you can meditate and concentrate just on that while the chair maintains your posture. 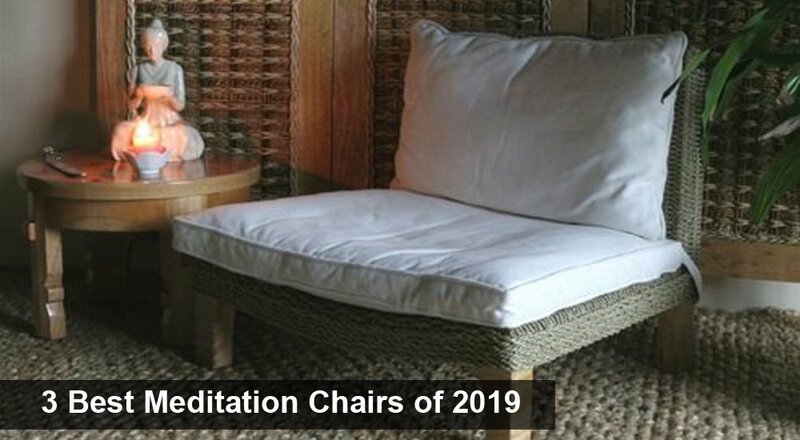 To make your hunt for meditation chairs easier, we have picked out the 3 best meditation chairs of 2019. ​The Friend of Meditation Relaxing Buddha Meditation and Yoga Chair is the perfect meditation chair that provides comfort and support. From your legs, up to your neck, you will get exceptional support. From teachers to students, this chair is a pick for all. Designed to alleviate pain from sitting in meditation position, it has support along the chair where the pain is expected to provide comfort. 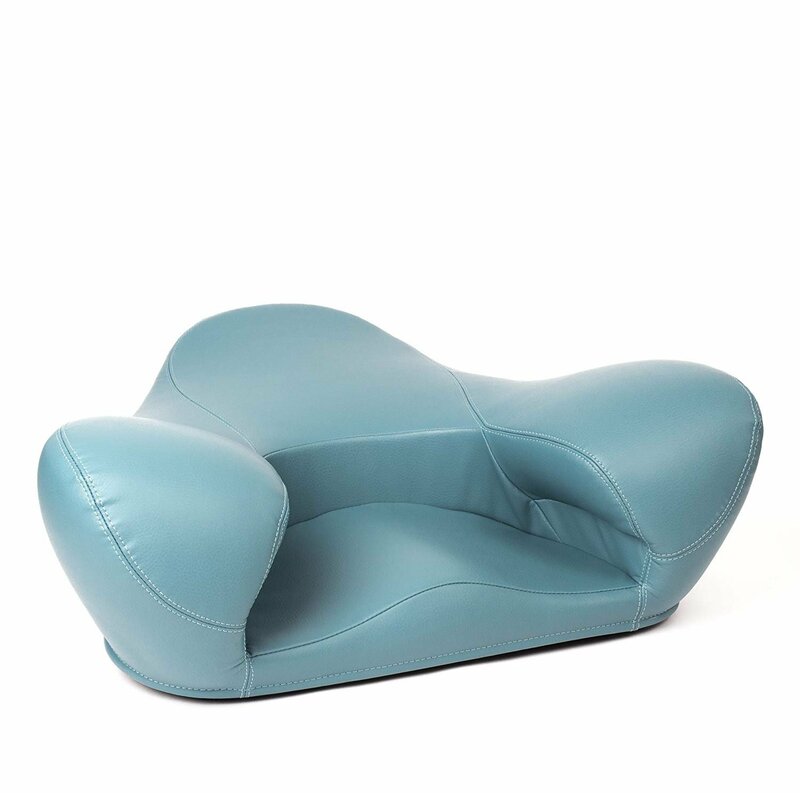 It uses foam which allows you to easily relax as you sit on the chair, the chair adapting to your body. It is perfect for anyone up to 6’ 2” and comes in four different colors. 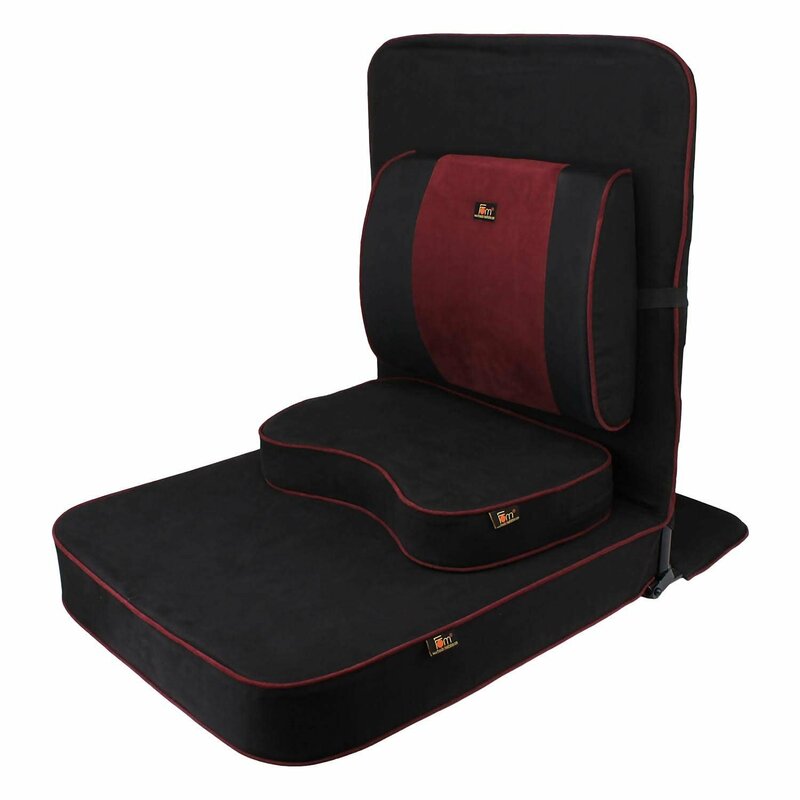 Overall, the Friend of Meditation Relaxing Buddha Meditation and Yoga Chair is a comfortable and durable meditation chair that will allow everyone to maintain their posture as they meditate. ​The Seagrass Meditation Chair is a chair with a more natural design and feel. It provides flexibility and fluidity in your posture and joints as you sit on the chair. It is made with natural material and provides exceptional lower back support. Aesthetically, the chair can easily fit into any room in your home. The chair is fairly roomy allowing you to easily fold your legs on it. The bottom support of the chair is curved which allows you to meditate in numerous different positions. The cushion is well padded and provide comfort as you sit on it. 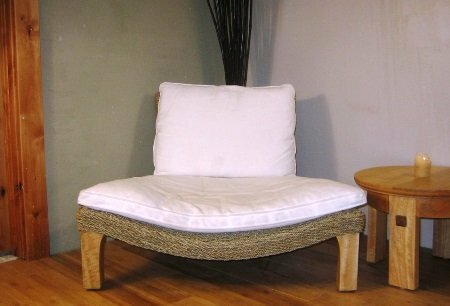 Overall, the Seagrass Meditation Chair is a great meditation chair which allows meditators to sit in various positions with complete comfort. The Alexia Meditation Seat is another comfortable meditation chair. Unlike the other two chairs on our list, this one uses leather like upholstery on the chair, which may not be the preference for some, but we found it to be comfortable. The chair is designed in such a way that it provides proper leverage to users, allowing you to slot your legs in the chair and sitting up straight. The chair is fairly heavy so not very easy to move around. Overall, the Alexia Meditation Seat gets the job done and allows you to meditate in comfort. Disclaimer: Thesmartestbuyer.com is a participant in the Amazon Services LLC Associates Program, an affiliate advertising program designed to provide a means for us to earn fees by linking to Amazon.com and affiliated sites. Clicking the device names, Images and See on Amazon buttons will redirect you to the product listing on the appropriate Amazon.com (.co.uk, .de, etc. ), where you can find the updated prices, customer reviews and more product details. Copyright text 2017 by The Smartest Buyer.